To fully understand how unique Europa and the Gelaendewagen, G.Wagen or simply G are, an understanding of their history is essential. The year 1979 marked the beginning of production for the Gelaendewagen including the civilian version. The original 460 model civilian chassis was closely related to the 460 military chassis with a part-time four-wheel drive system and two optional differential locks. Gas and diesel powered, the ‘G’ came in short, long and soft top versions which became Europa's original product line beginning in 1983. Although the vehicle was never officially imported into the U.S. a few hundred G's made it to the states during the era of casual imports, often referred to as the ‘Gray Market.’ By 1987, when the casual imports were outlawed, Europa International was already well established as a source of Geléndewagen know-how. Enough so that parts sales, reconditioning and used ‘G’ sales kept Europa going without a new car product. In that year, Europa began the daunting task of certifying the G.Wagen to federal emissions and safety standards including multiple crash tests, developing a driver's side airbag and redesigning the emission control system. 1990 marked the introduction of the 463 chassis Gelaendewagen. The new G was similar in appearance to its predecessors but with a substantial level of technical re-engineering and comfort enhancements. The G.Wagen had now become a refined and well-appointed automobile without compromising its outstanding off-road qualities. In October of 1993, Europa completed its costly, five-year U.S. certification program and became the exclusive U.S. importer and distributor for the luxurious, second generation Gelaendewagen. Being the sole source for the G.Wagen in North America, Europa became known as the experts for this rare vehicle. Technicians were sent to Germany for specialized training and a team of professionals was assembled to support the demand for this unusual and unique four wheel drive vehicle. Europa increased their nationwide marketing efforts focusing on the high-end luxury market. New owners would have their vehicle delivered via covered carrier directly to their front door. In 1997 Europa began development and testing for the next generation G.Wagen, the powerful G500. In 1999 after nearly two-years and over $1 million invested, Europa gained U.S. Small Volume Manufacturer status for the G.Wagen, finally making it a 50-state legal vehicle. With a V-8 engine and even more creature comforts, the G.Wagen’s reputation as the SUV of the elite was even further increased. Limited production ensured the highest build quality, with Europa selling over 10 percent of the worldwide G500 production. With the 2002 model year, and after purchasing the U.S. distribution rights for the Gelaendewagen from Europa, Mercedes-Benz began selling the G500 through its U.S. dealer network. Europa G.Wagen, LLC continues to maintain and support all Gelaendewagens and remains the source for pre-owned vehicles, spare parts, accessories and technical expertise. Born out of a joint venture in 1979 between Mercedes-Benz and two other companies, Steyr and Puch of Austria, the Steyr-Daimler-Puch Gelaendewagen was (and still is) virtually hand-built in Austria. It was first and foremost a heavy-duty off-road vehicle favored by various military groups and safari enthusiasts. Loosely translated, Gelaendewagen means "tough terrain vehicle." Those familiar with this rig usually call it by its nickname, G.Wagen. Usually propelled by a diesel engine, the early G.Wagen was not luxurious by any stretch (manual windows and tartan cloth seats were the order of the day) but developed a reputation for being able to get through most anything, no matter how treacherous or steep the terrain. These workhorses were offered with a variety of relatively frugal gasoline and diesel power plants. As with other Mercedes-Benz models, the numbers and letters indicated the engine's size and whether it was gasoline- or diesel-powered, e.g., the 230 G (gas) and 240 GD (diesel). Two gas models (the four-cylinder 230 and six-cylinder 280) and two diesel models (the 240 and 300) were available with horsepower ranging from 72 to 150. There were three body styles to choose from, a pair of short-wheelbase two-doors (hardtop and convertible) and a long-wheelbase four-door wagon. Although the G.Wagen was not offered for sale in the U.S., the so-called "gray market" of the 1980s made them obtainable by Americans with deep pockets. The gray market consisted of companies that brought European-spec vehicles to the States and modified them to meet our government's safety and emissions standards. One such company, Europa International, became so successful that it struck an agreement with the G-wagen people to build the vehicles it ordered to U.S. standards — that way Europa International wouldn't have to modify the vehicles in the U.S.. Advertising in such publications as Robb Report, Europa grew substantially, importing the various G.Wagens (two-door hardtop, two-door ragtop and four-door hardtop), customizing them for its clients and selling them for well over $100,000. the list of improvements that weren't readily apparent at a casual glance. Antilock brakes and three electronically engaged locking differentials made the G safer on road and more capable off. In addition to the standard locking center differential seen on most truck-based SUVs, the G boasted front and rear locking diffs that gave the Benz the grip and agility of a mountain goat when faced with treacherous terrain. Recognizing that the G.Wagen was being considered by some folks who cared more about power, luxury and foul-weather capability than all-out trail-busting ability, Mercedes brought out the limited-production, V8-powered 500 GE for 1993. As it was geared toward that aforementioned clientele, the 500 GE "only" had the center and rear differential locks, as the front one was typically employed only in the most severe off-road conditions. With 240 horsepower and a cabin trimmed in burled walnut and plush leather, the 500 GE was a precursor of what would be coming to America nearly a decade later. As with all other Mercedes-Benz models, the G.Wagen's naming system changed for 1994. From this year on, the "G" would come before the model number (that is, "G500" as opposed to "500 GE"). 1994 saw the introduction of the G320, a 3.2 liter 24-valve in-line six with 210 hp and for 1996 the G300 Turbo Diesel debuted, replacing the G350 Turbo Diesel. Although the 300 had a smaller engine, its output (at 177 hp) was actually greater than that of the larger engine it replaced. A few new models debuted for 1997. One of those was the new cabriolet that featured a power-operated convertible top. Another was the 290 GD Turbo Diesel (120 hp) that replaced the non-turbo 290 GD. The G320 likewise kept its name but received a new engine, a 215-hp V6. After its brief run in 1993 and 1994, the V8-powered G500 made a comeback for 1998, and became more widely available. In 1997, the first power-top cabriolet was introduced and, to celebrate the G.Wagen's 20th birthday in 1999, Mercedes rolled out a special edition of the G500, called the G500 Classic. This year also saw multifunction controls mounted on the steering wheel that operated, among other things, the audio system and trip computer. The year 2000 marked a turning point for diesel-powered versions of the G. Featuring the latest diesel technologies (such as common rail direct injection), the powerful G400 CDI provided brisk performance equal to (or even better than) equivalently sized gas engines. The technology windfall continued for 2001 when stability control (called "ESP") debuted for the G-Class. Finally, in 2002, the G.Wagen was available in the U.S. through the Mercedes Benz U.S. dealer network. Actually, only one model was chosen for power and luxury-hungry Americans — the G500. At nearly $75,000, the G500 certainly wasn't cheap, but considering that Europa was getting nearly twice that over 10 years earlier, it must have looked like a bargain for G.Wagen fans. A mild facelift, including mirror-mounted turn signals and lights, also occurred that year. Mercedes' in-house tuner, AMG, performed its magic upgrades on the G-Class for 2003; the result was the 349-hp G55 AMG. The G55 sported engineering and styling tweaks over the standard G500 that included a slightly larger and modified V8 (with 57 more horsepower and 51 more pound-feet of torque), side-exit exhaust, a prominent aluminum brush guard and unique 18-inch wheels with meaty 285/55VR18 performance tires. Time to celebrate. To mark the G.Wagen's 25th birthday, Mercedes rolled out the "Classic 25" model for 2004, essentially a G500 with special wheels, brushed aluminum side moldings, silver grille color and of course commemorative badges. Later in the year, a celebration of horsepower takes place with the G55 receiving the same supercharged 5.4-liter V8 found in the pavement-scorching E55. Rated at an astounding 476 horsepower, the muscle-bound V8 catapults the G55 to 60 mph in just 5.5 seconds. Top speed is electronically limited to 130 mph, more than enough for a heavy SUV. Other changes this year included a trio of additional standard features — multicontour front seats, a Harman Kardon audio system and rear parking sensors. 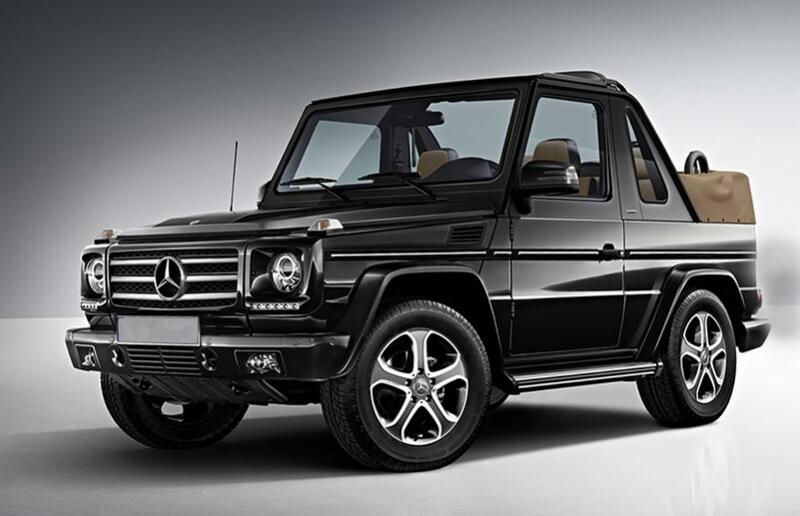 The Mercedes-Benz G.Wagen is one of the safest most exclusive, reliable and long-lasting vehicles ever produced.